I must admit I was afraid to listen to this album at first. I thought that I might not know how to hear, compare, or enjoy a solo saxophone recording. I like space and I like the edges of improvisation and music, but I was concerned that this would be to far off my own charts. However, I was intrigued as to what the phrase 'Time to do my lions' meant and my curiosity finally led me to the online liner notes of this recording. So what's with the lions? Catharsis. Apparently writer Anne Carson's poem Hokusai presents this phrase. Every morning the protagonist would wake and draw a lion to turn away anger and clear his mind and soul for the day. This seems like an apt and powerful metaphor for this solo woodwind album. Why else put the effort into creating a stripped to the bare essence recording, where raw emotion and naked musical ideas are front and center? No hiding behind supporting harmony, no skating away on some beats, just an internal rhythm and a need to roar and growl. The title tune begins with a delicate and fluttering melody, never repeating, just ever evolving and changing. Thus, not without reason and never disconnected, the tune grows, the tones get louder and the runs faster and longer. "12 o clock and all's well" uses longer and reedier sounds to develop a tune that is both mournful and playful. "Nisshan joma" is very delicate, full of soft low notes on the flute-like shakuhachi. It is followed by an upbeat clarinet on 'Gammer'. This is a varied recording, a generous offering of personable, personal, and pleasingly experimental songs. 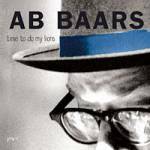 Baar's employs just the right amount of stream of consciousness to soulfulness in his melodies to make 'Time to do my lions' a fascinating one. I can confidently say I'm no longer afraid. "Time to do my lions" is a rewarding way to spend an hour. I would suggest listening to it from start to finish. I doubt it is something that I would put on to listen to just a song or two, but in longer doses it has some real power. This guy rocks. I love the sound of the sax. Is he playing at any of the blues festivals/jazz festivals this year?